Last week, I gave my two weeks’ notice at work. After six years of working as a full-time pharmacist, I’m making the leap to full-time YA author. It was exciting and freeing…but it also got me thinking. Working outside the home every day has provided me with many stimulating experiences that directly or indirectly influence my writing. How will I keep sharp when I’m focusing wholeheartedly on writing? And how will I keep the stimulation and creativity going? It turns out that it won’t be too hard. While brainstorming on the treadmill, I thought of 5 ways to keep my writing sharp. Check them out–maybe they’ll work for you, too! 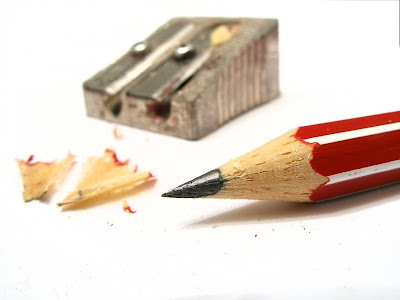 Sharpen your writing in five fun ways! Learn new words: As writers, we’re wordsmiths, and learning new words can revolutionize our work. Check out Merriam-Webster’s word of the day for ideas. Another fun thing is to create your own new words and have certain characters use them. Made-up words or combinations of two words can make your characters stand out. Be a yes-man or -woman: Say yes to new experiences, especially ones outside your comfort zone. If friends invite you out, say yes even if you’re tired. Not only will you have more fun, you’ll be more inspired. And yes, I say this from personal experience. The concept of YOLO does wonders for your writing. Network online: There’s a huge online network of authors, and all of us love sharing ideas and generating new ones. Twitter, Facebook, Goodreads, and Google+ are perfect places to connect with other writers. Attend (different) writing conferences: Conferences are the best way for writers to network with industry professionals face-to-face, because we all know live networking is sooo important. It’s tempting to go back to conferences sponsored by the same organization year after year. However, it’s more beneficial to attend different conferences every year, to meet new people and get new ideas. Write on location: Remember how inspired and energetic you were after a field trip in elementary school? Taking a writing field trip can do the same thing for you. I love writing “on location,” in the same city or area as the setting of my story–it really carries over into the mood. For example, I wrote much of my short surfing story, A First Time for Everything, in California. My upcoming novel is set in Chicago, exactly where it was written. And I’m pumped for my autumn field trip to Pennsylvania Amish country, where I’ll do research for the Amish fiction I’m working on. Great tips! I’ve been trying to learn new words too. Have you heard of freerice.com? For sure! I think writers are often the most voracious readers.